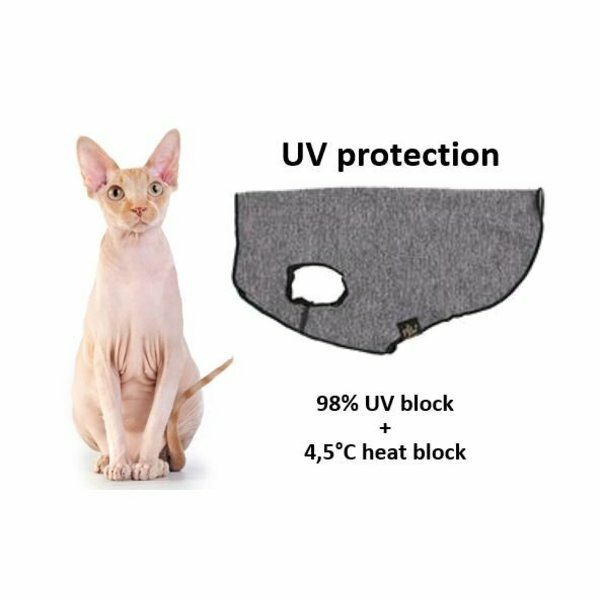 Nice T-shirts/Tanks for naked cats. Sizes: S, M, L => look in the chart to see what size fits your cat. Many naked cats find it very nice to wear something warm, some are indifferent and some don't like it. If your cat does not like it, don't put it on anymore. It should improve well-being or leave her well-being untouched. It should never harm the well-being. - Furthermore, it is also a possible solution of reducing allergic reaction. More often people choose a the Sphynx breed because of allergies. It can turns out later that it was an allergy to a substance in cat saliva or dander, which Sphynx cats also produce. A shirt limits the spread of saliva and dander in the air and can therefore sometimes limited the allergic reaction. - Avoid fabrics that are rough or wool. They may cause irritation. Wool is also quicky damaged by cat nails, and they can get stuck in it and hurt themselves. - Dog Jackets are usually too wide for cats, especially at the waist. Frequently they are stiffer and less flexible, making them not suitable for, the much more flexible, cats. - Decorations like buttons, ribbons, ... are also not recommended because nails can get stuck and they might be a object of play.